Foreword by Neil Peart.ÞÞTalent energy dedication discipline passion innovation education drive mind body spirit vision honor truth and ÊdrumsÊ make the man: Kenny Aronoff. Voted by ÊRolling StoneÊ magazine as one of the greatest drummers of all time Aronoff is arguably the most sought-after recording and touring beat master ever. Ignited by the Beatles' appearance on ÊThe Ed Sullivan ShowÊ in 1964 Aronoff's passion for drumming fervently grew and carried him from the kit in his childhood living room in the Berkshires to Bernstein at Tanglewood to Mellencamp Etheridge Fogerty Smashing Pumpkins the Rolling Stones the Beatles ä his heroes ä and beyond.ÞBut none of this would have been possible without his fierce work ethic and unique approach to drumming ä an integration of all parts of his being along with meticulous attention to note-for-note detail feel and Êwhat the song needsÊ. Both a leader and a team player in the mission to realize a greater good ä an unforgettable recording a riveting show ä Aronoff brings it every time. Through any setbacks ä heartaches failures injuries or plain fatigue from the rigors of the biz ä Aronoff has stayed the arduous and wild rock 'n' roll course. His tale of what is possible with unrelenting dedication to one's bliss is an inspiration to all.ÞÊSex Drums Rock 'n' Roll!Ê details Aronoff's youth in the Berkshires and the Midwest from his early inspirations to his serious classical and jazz study which gave him the foundation to be able to play ä anything. The failure of a first rock band in his early twenties had a silver lining: it freed him up for an audition that would change his life ä John Mellencamp. His work with Mellencamp catapulted Aronoff to the top of the charts with such hits as Hurt So Good Little Pink Houses and Jack and Diane and paved the way for session and recording work with droves of remarkable artists: Melissa Etheridge John Fogerty Bon Jovi Stevie Nicks Smashing Pumpkins the BoDeans Paul Westerberg Celine Dion Iggy Pop Elton John Bob Dylan Alice Cooper Brian Wilson Meat Loaf Joe Cocker and countless others.ÞIn addition to his work as a world-famous recording and touring drummer Aronoff finds time to be a dedicated teacher and has shared his expertise with students all over the world teaching clinics for Tama and Zildjian. Heading into his fourth decade of rocking hard Aronoff shows no signs of slowing down. Featuring rare photos testimonials from major artists and from those who know him best a chronology of live performances a discography and a foreword by Neil Peart this book is the story of one of the greatest musicians of all time. 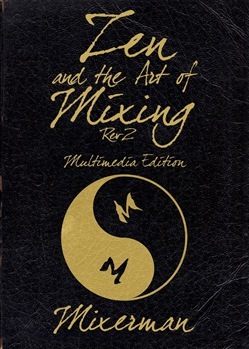 Acquista Zen and the Art of Mixing in Epub: dopo aver letto l’ebook Zen and the Art of Mixing di Mixerman ti invitiamo a lasciarci una Recensione qui sotto: sarà utile agli utenti che non abbiano ancora letto questo libro e che vogliano avere delle opinioni altrui. L’opinione su di un libro è molto soggettiva e per questo leggere eventuali recensioni negative non ci dovrà frenare dall’acquisto, anzi dovrà spingerci ad acquistare il libro in fretta per poter dire la nostra ed eventualmente smentire quanto commentato da altri, contribuendo ad arricchire più possibile i commenti e dare sempre più spunti di confronto al pubblico online.